On February 15, the second major diamond discovery of the year was announced by Australian diamond mining company Lucapa. 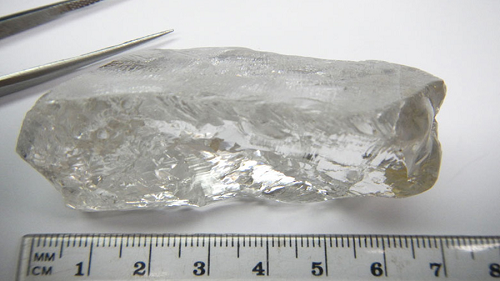 Following the discovery of the 1,111 carat rough diamond by Lucara Diamond Corp. not long before, the diamond that was discovered by Lucapa Diamond Company in Angola weighs an impressive 404.2 carats and is estimated to be worth about $14 million. The diamond is now the largest diamond to ever be discovered in Angola, beating out the Angolan Star, a 217.4 carat diamond that was discovered in 2007. The newly discovered diamond is the fourth and largest 100+ carat gem discovered since Lucapa and its partners began commercial alluvial diamond mining operations at Lulo in January 2015. It was mined by the Lulo Diamond Project, a partnership between Lucapa, Endiama, Angola’s national diamond company, and a private investor. Lulo, which is about 700 kilometers east of Angola’s capital Luanda, is located 150km from Alrosa’s Catoca mine, the world’s fourth largest diamond mine. The Lulo Diamond Project began exploring a 1,148 square-mile plot of land in central Angola in 2015, and the area has so far produced more than 60 “large special diamonds,” the company said. According to Lucapa’s official statements about the discovery, the Type IIa D color stone is the biggest diamond ever found by an Australian company. Its characteristics were analyzed and determined by New York based diamond retailer Yehuda Diamonds. Angola is the world’s fourth largest diamond producer by value and the sixth largest by volume. Its industry, which began a century ago under Portuguese colonial rule, is successfully emerging from a long period of difficulty as a result of a civil war that ended in 2002. Angola is famous as being the poorest country in the world today. The government has recently reduced taxes on its mines and cut state ownership requirements after the global financial crisis forced many mines to close, with the goal of rekindling its industry and maintaining jobs for its citizens. Lucapa, a relatively tiny diamond exploration company, is traded on Australia’s ASX stock exchange under the symbol LOM. It suspended trading a few days in ahead of the announcement. When Lucapa resumed trading that Monday, its shares jumped 30%. All in all, this diamond discovery (and the discovery of the 1,111 carat diamond by Lucara that preceded it), are good news in the ears of the flailing diamond industry, which desperately seeks an injection of worldwide consumer interest to reignite the market. White diamond trade took a major hit in 2015 due to a combination of factors which together made an unfortunate impact. Although 2016 has seen an increase in polished diamond prices, the industry has a ways to go before diamond trading is what it used to be. In the meantime, fancy color diamonds prices remain unaffected and this diamond discovery also will not affect anything in the fancy color diamond market. With the announcement of the diamond’s discovery, it will probably go on tour before finally being put up for sale. Lucapa has estimated the final price to be $14 million but in today’s exciting market it is anybody’s guess what the final price of the diamond will be. After all, in November the Blue Moon diamond was sold for significantly more than what was predicted. 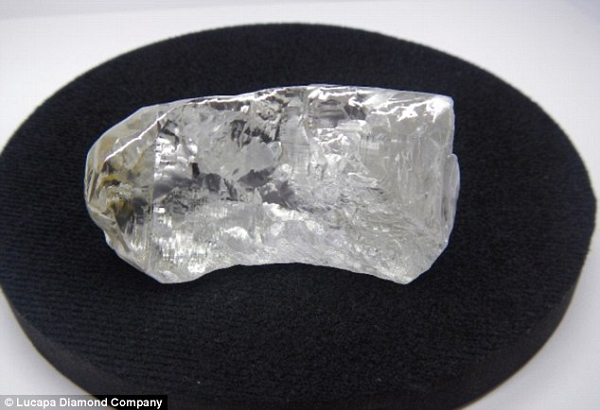 Lucapa claims that this is the 27th largest diamond ever found in the world, and it is said to measure seven centimeters, about the size of a credit card. We’ll take that kind of credit card any day! What do you think of this new diamond discovery? Let us know in the comments section below!